A dormant volcano, a mystical forest and an ancient prophecy… The adventure of Icarus begins. Deep within a forest, at the summit of a volcano, exists an extraordinary world-a world where something is possible. A world called Varekai. The word Varekai (pronounced ver·ay·’kie) means “wherever” in the Romany language of the gypsies the universal wanderers. Directed by Dominic Champagne, this production pays tribute to the nomadic soul, to the spirit and art of the circus tradition, and to those who quest with infinite passion along the path that leads toVarekai. 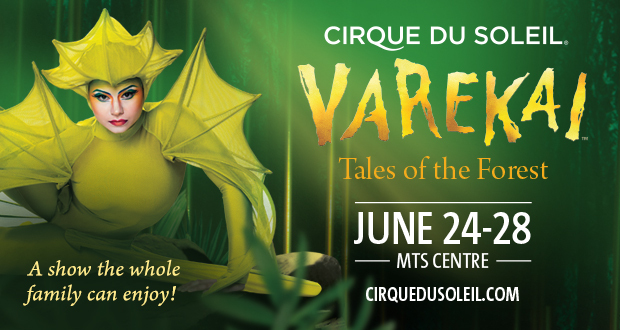 Cirque du Soleil will perform in Winnipeg with Varekai at MTS Centre from June 24 – 28, 2015 for eight performances only. Tickets are on-sale NOW through www.cirquedusoleil.com/varekai or by calling 1-855-985-5000. Ticket prices range from $40 – $95 (subject to change).